Bill DeRoche had nearly finished stringing the holiday lights outside his home Tuesday when he was suddenly knocked to the ground by a jolt of electricity. "When the first responders got here, they said they expected to be taking away a corpse," said DeRoche's wife, Karen LeClair. But on Wednesday, DeRoche returned to his Merrimack, New Hampshire, home with few injuries-third degree burns to the sides of his feet and some sore hands. "He's lucky to be alive," LeClair said, "I'm counting my blessings." DeRoche accidentally hit a power line with a metal pole he had been using to decorate atop the family's outdoor tree. The contact sent about 20,000 volts of electricity into the ground. "The pole was both his curse and his savior," LeClair said, "The electricity went through the pole and into the ground, and he got the residual I guess, more or less." DeRoche spent one night at Massachusetts General Hospital's burn unit, but decided to go home the following day. 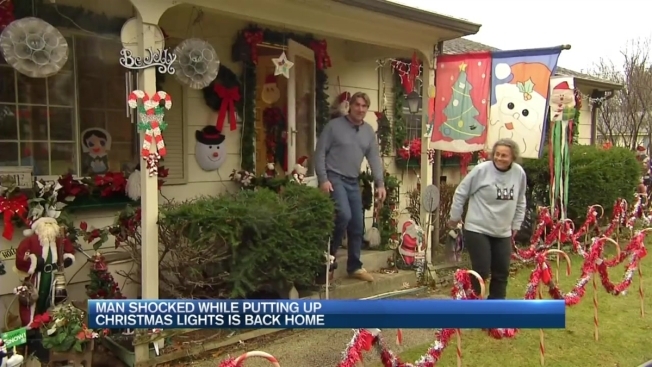 Despite the scare, the couple has already returned to their holiday decorations. The lights on the lawn were back on by Thanksgiving night. Now, they hope to complete the tree. "It was a freak thing, I think. We've been doing this 20 years," LeClair said,"I managed to make ends meet and have the place looking pretty."